An evergreen shrub to 16″. 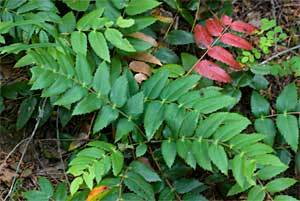 Leaves contain 9-19 leaflets with a central vein and spiny teeth. 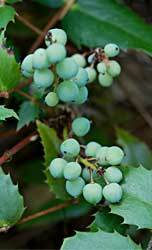 Bright yellow flowers in the spring followed by tart berries that turn blue when ripe. Bark is yellow beneath surface. Found in dry to moist open forests. Native to west coast BC to California.